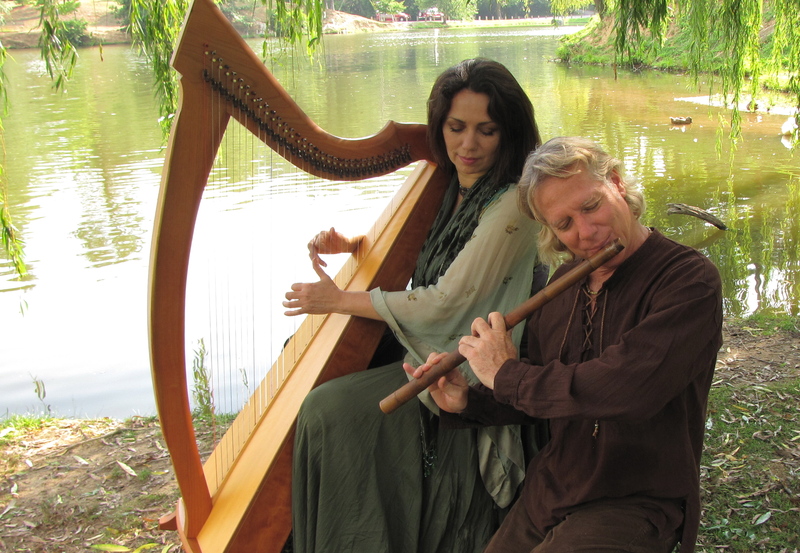 The Celtic harp and bamboo flute are two of the world’s most ancient and heartwarming instruments. Since 1997, Lisa Lynne and George Tortorelli have been charming audiences with their magical and endearing sound. Their melodic and pastoral music enchants listeners from every walk of life, and is a marvelous addition to any special event. Lisa Lynne is a multi-instrumentalist and performer who has gained worldwide recognition for her original music featuring her Celtic Harp. She specializes in Traditional acoustic folk and rare instruments and is widely acclaimed for composing memorable and heartwarming melodies that transcend category and genre. Lisa has received multiple grants and media recognition for her groundbreaking interactive “Hands-on-Harps” interactive programs. She brings her harps to various establishments to empower others with her harps at Cancer support centers, schools, elderly care homes and rehabilitation centers. Lisa was recently chosen by Los Angeles Magazine as one of LA’s 50 most inspiring women. George Tortorelli is a master bamboo flute designer and player. Being raised in a musical family, he had access to many instruments, and went on to perform in rock bands throughout south Florida. Eventually he longed for simpler pastures, and retreated to the forests of north Florida. With a collection of rare and exotic instruments, he was inspired by the beauty of the nature and harmony there. He discovered and nurtured an abundance of bamboo on his land, and commenced expanding his growing flute collection with flutes of his own design. His music and concerts were so loved by surrounding communities that he became known as “Medicine Wind” for the healing quality of his peaceful gatherings. He started his own company and commenced a successful recording career, as well as doing custom flute designs for fine arts festivals. It was at such a festival that Lisa Lynne & George Tortorelli met. After an exchange of albums, it became apparent that their individual music was very much of kindred spirit. So they collaborated, and it was a match made in heaven. 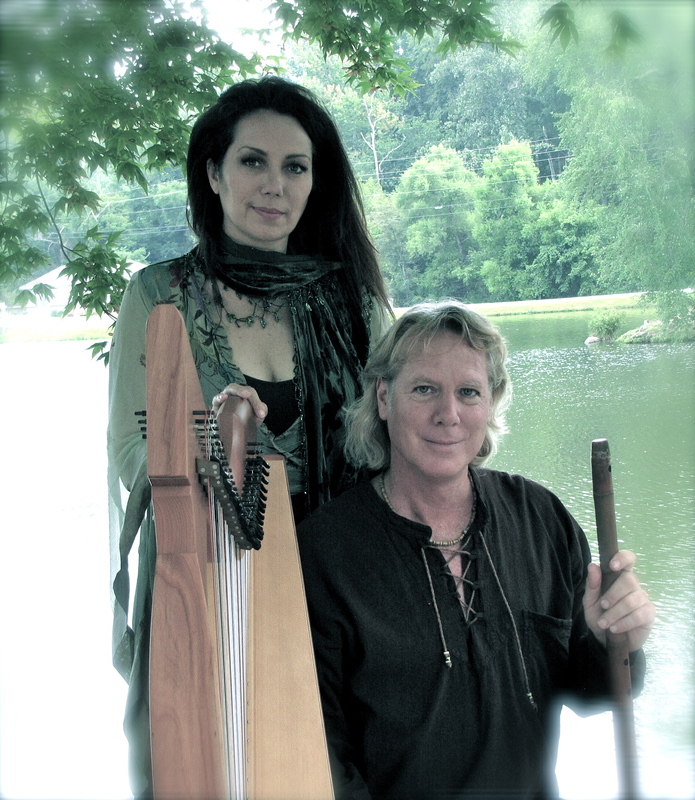 The Celtic harp and bamboo flutes are two of the most ancient and beloved instruments. Since February of 1997 they have been spellbinding audiences with their magical and endearing sound. They have recorded seven albums together and travel and perform nonstop. They are featured at the country’s finest art fairs, music festivals and performing arts centers as part of the Windham Hill Winter Solstice Concert series.